Punching opponents in virtual reality is as awesome as it sounds, but soon it’ll also be a double-edged sword. Meet Impacto, an armband that re-creates the experience of actually being punched–without the pain, of course. Virtual reality accessories have a tendency to be bulky, uncomfortable contraptions that are often a hassle to wear. That’s why researchers at the Human-Computer Interaction lab (HCI) at the Hasso Plattner Institute in Germany created a prototype that’s less-invasive and relatively comfortable to wear. Combining haptic feedback–taps and vibrations on your skin–with electrical muscle stimulation, the armband simulates the effects of impact force by thrusting the user’s arm in a direction that’s convincing. 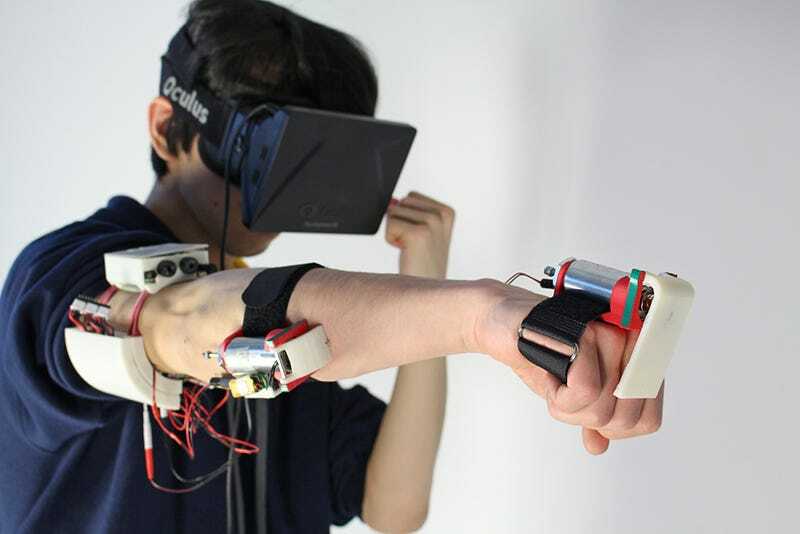 The research team demonstrated the technology using Impacto to play a virtual reality boxing game in which the user blocks punches from an opponent while feeling the sensations of actually defending themselves in a fight. The armband can also be used to play soccer games by strapping it to your ankle to feel the sensation of making a pass or bouncing a soccer ball off your foot in virtual reality. As virtual reality tech becomes cheaper and more ubiquitous, lightweight accessories are crucial. Impacto’s design is a step in the right direction in avoiding clunky-ness and allowing users to feel impacts that are as fast as 200 milliseconds. The research team is already building on what they’ve made by investigating ways to extend the feeling of continuous pulses over time–like to better project the feeling of driving a car along a guardrail in a virtual racing game. Still no word on when researchers might create a full-body suit that simulates being hit by a bullet.